Quality Zipper & Supply has been an AUTHORIZED YKK® DISTRIBUTOR since 1991. We are family business that pays attention to detail and our customers. We do one thing and we do it right: Wholesale YKK® Zippers, zipper parts, and fasteners! We have thousands of customers spread over all 50 states that buy zippers from us and the reason is simple: quality zippers made by YKK® (the world’s best and most popular zipper), low prices, great selection, and fast and accurate service. Order your zippers online or order your zippers using our very simple zipper price list/order form, either way, we make ordering zippers painless and easy! We are the YKK® supplier for many types of businesses including manufacturers, alteration/tailor shops, dry cleaners, shoe/leather repair shops, dressmakers, fabric stores, sewing contractors, fastener distributors, and any business that buys bulk zippers. As a zipper company that is a YKK® distributor, our minimum order is $50. We stock zippers for every application: metal zippers (antique brass, brass, antique nickel, oxidized black, and nickel/aluminum), VISLON® (molded plastic) zippers, coil zippers, invisible zippers, skirt/dress zippers, jean zippers, waterproof zippers, tent/sleeping bag zippers, purse/handbag zippers, continuous zippers (zippers by the yard), industrial zippers, and bulk zippers. In addition, we have the largest selection of zipper parts of any YKK® zipper company. We stock all the popular YKK® sliders, also referred to as zipper heads or zipper pulls. Choose from over 145 different zipper sliders. We also have top and bottom stops in stock. We also wholesale fasteners, including garment snaps, spring snaps, jean buttons, and hook and loop (Velcro®). Can’t find the exact item in you need in our YKK zipper catalog or can’t match the color you need from our zipper color chart? No problem, special orders are available for any YKK® product you desire. 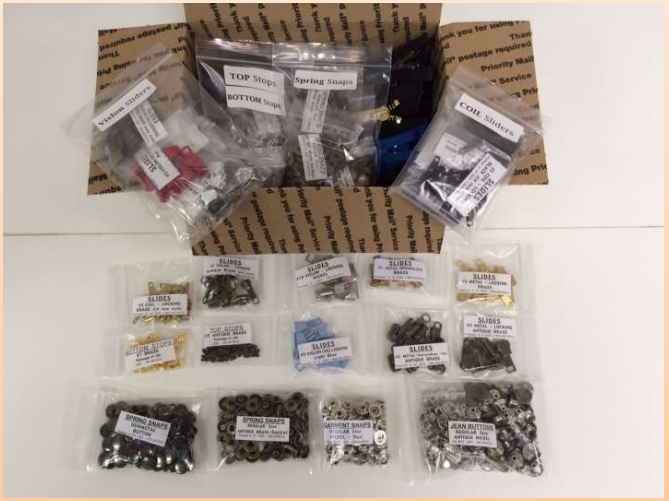 Whether you are a large manufacturer looking for fast service or blanket purchase orders, an alteration shop that depends on getting the items you use on a daily basis, or a shoe/leather repair shop looking to save money, we are your source for YKK® zippers, zipper parts, and fasteners! What can Quality Zipper do for you? We make ordering easy...you will love how easy we make ordering these pesky zippers and parts! Discounts! 5% if you order online and discounts built in to the order form when you order in quantity!